Corporate Social Responsibility has become a popular addition to many incentive programs in recent years. The idea that a company can take a small portion of time during a trip to do charity work not only helps the community they are visiting but makes their employees feel good. But why limit volunteerism to a once-a-year addition to the incentive trip? By integrating it into an everyday employee engagement strategy, it can raise employee morale and make your staff feel good about themselves and the company they work for. Recently some of the FLG staff spent time on a Tuesday morning helping out at the River Food Pantry, a local food and clothing pantry in Madison, WI. They are a great organization that help the needy in the Madison area. As Dane County's busiest food pantry, River serves about 600 families per week. While they are technically a christian organization, they welcome those of all faiths. In fact, they actively encourage those of other faiths to help and join the community. On Tuesdays, Thursdays and Fridays, the pantry is open to the public. On Tuesday, our staff members took on different jobs and helped clients who came in to get food from the pantry. The process was fairly straight forward. Based on the number people in a household, families were allotted a certain amount of groceries, measured by weight, which they were able to choose for themselves off of the shelves. They were also able to choose their meats, fresh produce and dairy. I love this method since many other pantries I have seen choose the food for their clients. The choice truly makes all the difference. I personally worked the "meat area" and was pleased to be able to give people so many options. You would think a pantry would only have had hot dogs or ground beef but there were steaks, pork tenderloins, brats, chicken breasts, and even some whole chickens and beef roasts! It was great to see such a variety of donations from the area supermarkets and distributors. I'm glad people got a real choice since tastes and diets vary so widely, especially given the large diversity in ethnic backgrounds that use the pantry. I'll tell you, I was positively drooling over an unclaimed rack of lamb that were in the bin in front of me. Lucky for me, my drooling didn't have to last long since River Food Pantry also feeds people in-house. In addition to feeding their volunteers after each shift, on Tuesday and Friday nights they open up their doors and feed whoever is hungry. They have a talented head chef, Ray (seen below in the black apron), who cooks all of the meals in their on-site kitchen with the help of volunteers. I was impressed with the variety of food choices Ray had out which ranged from barbeque beef to spaghetti with sausage to salad with fresh veggies. He even made a large chocolate "Texas Pan Cake" with nuts on top. Delicious. The pantry also has a small clothing and home goods area where people can give and receive apparel items as well as various household items. We did not work there during our visit but it is great to know that they offer free, decent clothing to those who need it. It was interesting to learn that what they need the most is men's clothing. Once I thought about it, I realized that most of the guys I know wear stuff until it is nothing but threads so perhaps they just don't have that much to donate. Either that or the thought of donating their old clothes to the pantry never crossed their minds. Well, now I know where I am taking all of my husband's unwanted clothes from now on. All-in-all, this was a humbling experience as it certainly reminded me that there is a great deal of need in Madison, even if we don't see it on our daily commute or everyday lives. The River Food Pantry staff, volunteers and clients were all wonderful, gracious people with big hearts. This pantry is located less than a mile from my house and, before this, I didn't even know it was there. Now that I know where it is and what it's all about, I plan to go back and help out as often as I can! If you are looking for ways to give back personally or company-wide, here are some ideas for charity projects that you can find or organize in your area. The opportunities for doing good are truly endless! I know with the speed of business it is often hard to find time to volunteer. However, it was such an excellent team-building experience for our staff that the time spent away from the office was well worth it. It is actually pretty amazing that more companies don’t use this opportunity to engage their employees. There are people who give so much back every day, for us to find a few hours in a month or quarter seems like it is the least we could do for the community that we live and work in. If you don’t have the time or inclination to organize something on a company-wide scale, perhaps you can help make change your corporate policy to include concessions for volunteerism. For example, giving the employees one paid day, or even an hour, per month to volunteer much like Randstad Canada has done. What a fantastic dynamic that must create in the office! Corporate charitable giving is great (and much needed) but nothing makes people feel good like actually doing something where they can see the benefits of their actions. 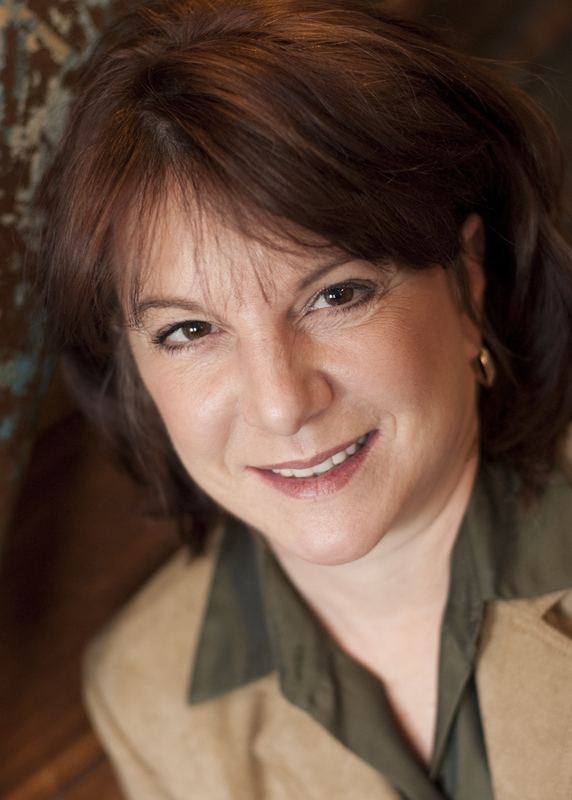 It builds strong bonds among your staff and even stronger ties to your organization. It helps employee morale and retention but most of all, it's just a really good thing to do for the community that supports you and your people. PS. A small post-script on the clientele at River Food Pantry. I think a lot of people don't volunteer because they are scared to work with the homeless or needy. They expect people to be crazy or mean or drunk or think they will not be able to relate to them. My experience was quite the contrary. Most of the people I met were very gracious and friendly, just normal folks trying to get by. I think one of the most important lessons that can be taken away from this experience is that it can happen to ANYONE. If I or my husband were to lose our jobs tomorrow, we could be on the other side of the table in no time. Seeing and understanding this can really change your perceptions of what "need" is and exactly who it affects. We've all been there. Your boss comes up to you and wants a simple answer to a complex question. In this case, she wants to know how the corporate engagement strategy is going. You can't come back to her with a platitude like "it's fine". You need something solid and quantifiable. But how do you measure the perks, prizes and recognition against the business benefits and put it into a solid number? So, how do you get the numbers to plug into this equation? Any engagement consultant worth their salt should be able to help you determine them. However, there is a way to figure them out for yourself. It might take a little effort but the rewards are worth the time. 1. The very first thing you need is an understanding of what you want to prove or validate and what impact that ultimately has on your business. So if the goal of your engagement strategy is to measure how “engaged” people are, you need to determine what determines engagement first. Things like employee turnover and productivity are a numerical measurement of employee engagement. Sales and repeat buying habits are measures of customer engagement. Increases in dealer sales are measures of channel engagement. Of course there are many other measures that could be analyzed, but this may help you get started. 2. Survey the audience. Perhaps sprinkle in a few focus groups and dig up any data that might help you understand where you are starting. 3. Analyze this historical and current data to draw a baseline. 4. Develop your strategy, preferably with two groups, one where you will focus the engagement strategy, and one control group where you can measure the effect. If your strategy is corporate-wide to start with, then your control group has to be the past group performance before there was an engagement strategy. 5. Determine what you will measure; i.e. sales, productivity, turnover, etc. 6. Determine what the true cost of the strategy is, including all items that go into the strategy, marketing, staff time, meetings, opportunity costs, etc. 7. Go back to your measurements and see how much they have improved based on the implementation of the strategy – divide it by your total cost, multiply by 100 – and voila you have your ROI Soup! Now really, that does not sound so hard does it? Remember that ROI will never be a completely exact science, but like a recipe, it should turn out basically the same every time you make it. The ingredients are what change it! This is my last day in Sydney, and I cannot find words to explain how I feel right now. I can't wait to see my family and others back home, but I will miss so much about Australia. I think that the thing I will miss most about this trip won't be the amazing weather, beautiful scenery, or fun adventures camping and diving, but the amazing people that I have met along the way. Every amazing thing that I have experienced here has been with some very incredible friends that I have made along the way. We began our trip in the little town of Marsfield, and ended up exploring the east coast, from Byron Bay to the Gold Coast, to The Great Barrier Reef in Cairns. 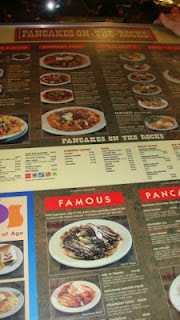 We shared meals, many times at our favorite place Pancakes On the Rocks in Sydney. Most meals had being heaps of pasta and veggie meals, and many Sundays we got together to have our family dinners. We also consumed large amounts of goon at times as any broke college student would. 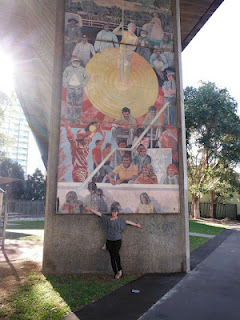 We explored the city and the artwork and nature of Sydney. 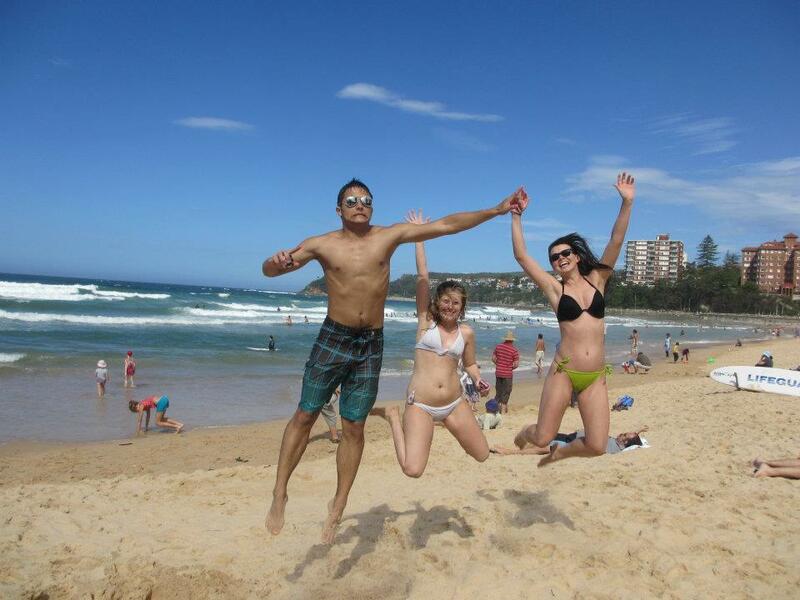 We spent every sunny day we possibly could out at the beach tanning, surfing, snorkeling, and climbing the cliffs of Bondi and Manly Beach. 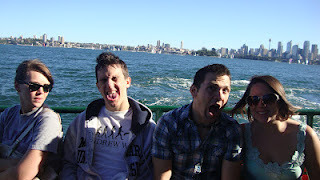 We fought off hungry and annoying seagulls on numerous occasions, some of us losing our food in the process. We went on cruise ships around the harbor and spent many hours wandering and trying to find our way home. We spent many fun nights out at the pubs and campus bars, but of course we had the most fun having our small parties at our own house playing games, both drinking and board games like Life and Settlers. We went to a play at the opera house; Macbeth of course! 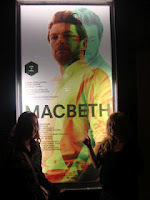 It was a great experience and a must see. 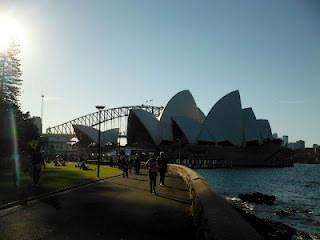 The opera house is beautiful on the outside, and average looking on the inside, but it is a great experience to go see one of their many shows. 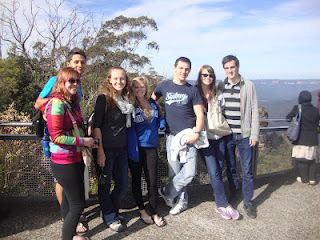 We visited the beautiful Blue Mountains, which are actually blue looking. At the mountains you can climb down the steep stairway to the sister rocks, then ride a sky rail back to the top, or climb back up which we did and I do not suggest at all! We visited the Botanical Gardens which are very pretty and free to visit! Also the trees are full of bats; hundreds and hundreds of bats which are very awesome. We did everything we could possibly afford and we had an incredible time with everything we did. I wish I could have done so much more while here, but it was all such an amazing experience and I wouldn't trade this experience for anything. I met so many amazing people who have changed my life and opened my eyes to a whole new world of things, and I have made some lifelong friends that I will never forget. 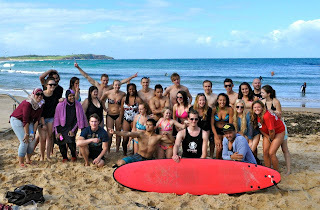 I hope to see them again someday, maybe on a dive trip or another camping trip, but whatever we do or wherever we go, I will not ever forget my new friends from around the world and my experiences in Australia. My trip to Cairns was my absolute favorite yet. I became a certified scuba diver in the Great Barrier Reef and it was the most incredible experience of my life so far. 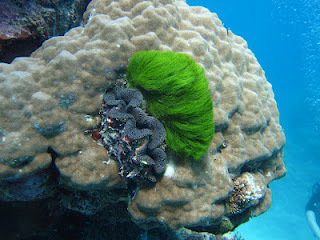 If I had to suggest any experience for another person to have at some point in their life, it would be to dive at the Reef or another place like it. 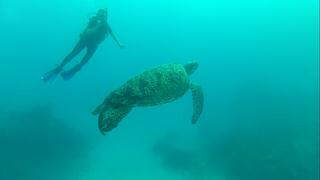 I cannot express how amazing it was to swim with sea turtles, sharks and so many colorful and beautiful sights. The photos do not come close to doing it justice. The week long trip started with a cheap flight to Cairns, and a day on a boat seeing the sights and searching for crocodiles. I do regret not making it out to the rain forest, but the trip was an overall success. 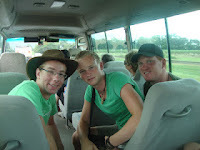 We booked a trip cruising around the water searching for crocodiles, then later visiting a crocodile farm where they breed and raise crocodiles to protect them from the difficulties of surviving in the wild. I will say now, I am not a fan of crocodiles. I don't like anything that can eat you both on land AND water. That is to scary for me. 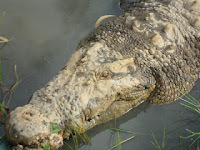 However it was fun actually seeing a live crocodile. If you are into that you should go check it out, they are huge animals; some guys were jumping my the fence at the farm and the crock ran at them, bit the fence, and bent it. They are scary! On the crocodile cruise we ran into the same German friends we had met at a campsite in Byron Bay! They had been travelling around Australia and we had no idea they would be in Cairns at this time; we were amazed to be on the same cruise as them a month after camping with them in Byron. 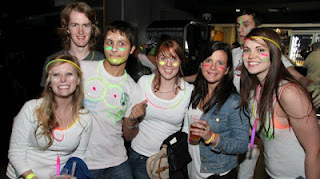 Meeting backpackers from around the world is an absolute blast. You learn so much about others and who knows you may even see them again in your travels! We went out for drinks with them later that night, and they told us all about diving the reef which they had just finished doing. I stayed in a hostel with my friend Jordan, and we decided on a female only room. The hostel was great for the most part, 15 dollars a night, a free delicious breakfast and dinner every day, free internet, and nearly clean rooms. The only problem was on the last day when I had been gone for half of a day, came back, and my things were gone, bed made, and none of my clothes or belongings were to be found. I went to the front desk and asked them about it, and they came back with good and bad news. The good news was they found my things, bad news it was in the trash. For some reason they thought I had checked out, and decided it would be a good idea to throw away all of my belongings. So be careful when staying in a hostel; luckily my important things were with Lukasz and Laura in their hotel. The workers dug my things out of the trash and paid for laundry and a new tooth brush, but wouldn't refund us for the night. I was not too happy, but the excitement of beginning our first dive in the ocean kept my ecstatic. The dive program we signed up for is called Pro-Dive, and I highly suggest doing the 5 day program with them. This trip was a perfect experience, with great instructors, amazing food on the boat, and fun people. I do not have a single complaint about the program. I couldn't believe how amazing the whole thing was. It began with two days of classroom and pool training in Cairns. Cairns by the way is a small area, and everything is in walking distance and easy to navigate. The Pro-Dive people do pick you up from your accommodation and drop you off each day, and the training is fun and essential. I never realized how much work goes into diving until I began my training. 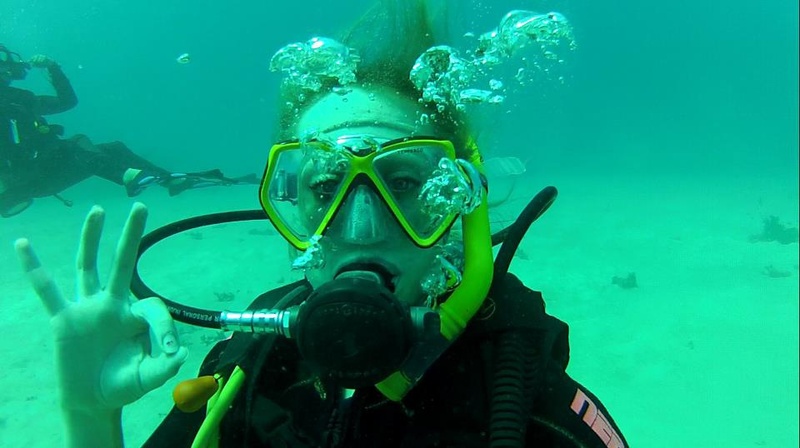 The classroom is easy, and the instructor gives you the answers on the exams and goes over everything so you understand, and the training in the pool consists of putting on gear, practicing emergency situation, getting used to being underwater, using your equipment, and diving 4 meters under. Some of the tasks were a little intense, and anyone who easily panics, especially under water, should maybe not try diving. Many of us had a few moments of minor panic at one point in this trip. For my friend Laura and I, we had trouble with mask clearing. You had to take off your mask under water and put it back on, blowing the water out of it. Both of us are unable to be underwater without plugging our nose, so we ended up choking on water and coming up for air the first few times. This was an important skill to learn and we would have to be practicing it 10 meters under water in the ocean at one point, so it was learn or don't dive. Other skills were ones like floating and breathing, taking off your gear underwater and reassembling it, learning how to communicate under water, and practicing sharing air in case one person runs out. These are all practiced in both the pool and the ocean to make sure you are ready for any situation. After a few long days of training, we were finally ready to jump on the boat and begin our training dives in the ocean. They picked us up nice and early, and we joined the group of 30 divers on the boat. I have never thought I would be someone to get seasick, and I would like to stress this to any person planning on doing this trip, please don't be cocky like me and just take some sea sick pills 30 minutes before the boat leaves. I was sure I would be fine, but these boats are made for shallow waters and rock so much and so far, I was ill the entire 3 hour drive to the outer reef. It was not a fun boat ride, and I was fine the next time when I decided to take some pills. 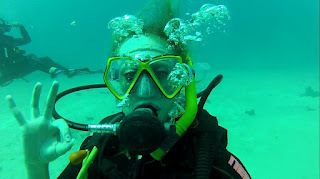 Luckily as soon as we were in the water the sickness went away and I was ready to dive. We had two training dives the first day, and we practiced equalizing our ears, and the other skills at around 10 meters under water. This first dive was where it all became real. I put on my heavy gear, stood on the edge of the boat, and thought "Oh god, this is it, I'm going to die". When you jump in and take your first breath, it feels so unnatural and a little scary, but you keep breathing and you are alright. I swam to the rope and began my decent to the bottom. 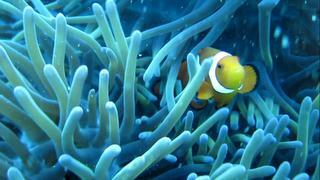 Although I was nervous, I couldn't help but be amazed by the sights of the Reef. There are so many colors and the craziest looking fish, I didn't know fish could look like that. The dives were good, but the real fun happened when we finished our four open water training dives. 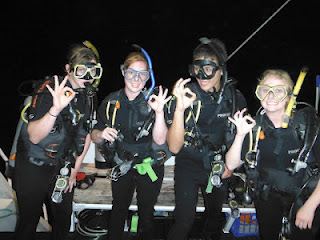 We had finally become certified divers, and we were ready for our five fun dives. We lived on the boat for three days and two nights, and our days were nonstop dive, eat, sleep. We were up by 5:30, in the water by 6:30, out and eating breakfast, in the water again, out and eating snacks, in the water, dinner and a nap, dive, then snack and bed. Although it was a couple of busy and early days and we were absolutely exhausted, I was loving every minute of it. The dives weren't the only thing that made the trip amazing; the people were fun and the food was incredible. We were provided meals every day, and these were delicious and huge meals. There was an amazing chef on board, and we had enough food for huge plates of seconds and thirds for each person. 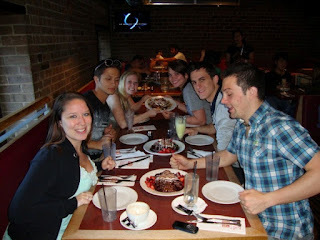 The instructors were a blast as well; we played trivia games one night and had a great time diving with them. I couldn't have asked for anything to be better. I've never been so satisfied with any kind of program before like I had been at this one. It was just perfect. Our first fun dive as newly certified divers was one of my favorites. There was a group of five of us, and we were free to swim around and check out anything we wanted to down to 18 meters under water. We were starting to get used to moving around and controlling our breathing, making up our own dive lingo under water, and having more fun every dive. 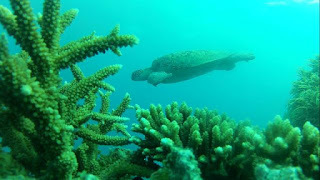 We swam around the beautiful corals and fish, and finally, a giant sea turtle swam out from behind the reef. This was my favorite thing to see. The turtle was giant, bigger than any of us, and was so majestic. It was too good to be true. It flew through the water in slow motion, and swam around with us, checking us out and gliding over the reefs. Eventually a baby turtle joined in the fun and swam around with us. 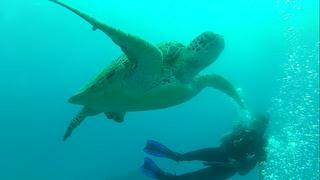 It was an incredible experience and I am so happy to have seen a turtle. We had four dives on our second day, and our last dive was a night dive, and this was an interesting dive. The instructors threw some food off the boat for fish to eat, then turned on the spotlight. You could see the fins of sharks circle our boat as they searched for fish to eat. The instructors then said to us, "Ok, jump in!" Excuse me? Jump in? With the sharks? One thing you must know, sharks are scared of divers! We are big and noisy with our bubbles and look nothing like their food. We jumped in with the sharks and they swam away immediately, circling from a much further distance. It was amazing! There were some pretty decent sized sharks below us, and we had a great time. We followed a guide on this one and used our flashlights to check out the night life of the sea critters. It was difficult to see much, but there were sharks, and a huge brittle star fish. The last day on the boat was amazing. We had our last three fun dives, and we had such a great time. 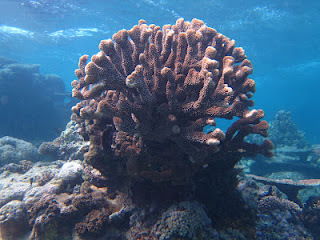 We were finally comfortable in the water and exploring the reef, taking photos, and having a blast. We saw clams, sharks, more turtles, fish, cuttlefish, most of the fish from Finding Nemo, we saw Nemo, sea cucumbers (who poop a lot by the way, it looks like clumps of sand and is fun for throwing at people), and so many other incredible things. I also gained a nick name on this trip, our instructor Steffen Binke, who is an award winning German photographer, gave me the name "pocket rocket" because I'm too tiny to sink. Every time I got to around 5 meters to the surface I would just pop right up to the surface. People had to hold me down until I could stay under again, which was somewhat hilarious, but also dangerous. If you go up to quickly you can get decompression sickness, which could paralyze you for life, or kill you. Not good! Luckily I had my dive buddies to help me out when I started floating to quickly to the top. The diving had ended, and we were exhausted but did not want it to ever end. 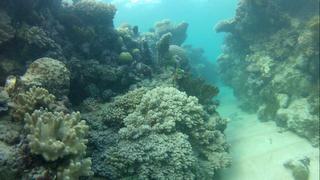 The trip was too amazing, and I wish I could be back there diving right now. The weather was beautiful and tropical (unlike in Sydney where it is now getting colder), the people were great, and the sights were beautiful. This is definitely something I will continue to do throughout my life. The last night we met up with the group from the boat for dinner and drinks. We said our goodbyes to our new friends, and headed back to the hotel and to Sydney a day later. I feel like everything I have said can't do this trip justice, and I think everyone should experience it at some point; it is the trip of a life time. It was also completely worth the fact that I am nearly broke now. I give it 11 out of 10 on the incredible scale. I am now in my sixth week in Sydney and let me say first, I am loving every minute of this trip, and I still have so much to do and learn. One thing I realized while reading through my previous blogs was that I haven’t said anything about the college I am attending! 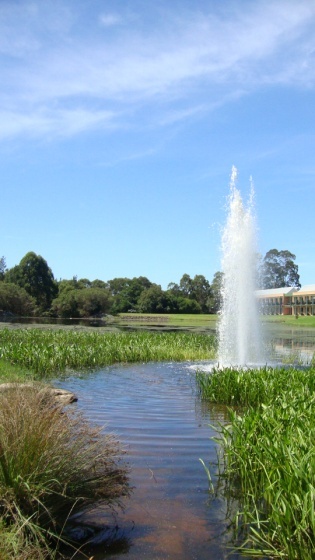 I am studying at Macquarie University in Marsfield, and it is an absolutely beautiful campus. I am having a great time at this university and the courses are interesting, professors are laid back and funny, and the hours dedicated to school work still give me just enough time to spend traveling and relaxing at the beaches on weekends. I have yet to learn what the grading system is like here, but I feel like I am learning so much more at this university than I have at any other. Another bit of exciting news, this university is great at helping you find internships, which I have two of! I am a psychology major, and I am working with one program to help design games for a program working with people with schizophrenia and helping them improve their social skills and their cognitive skills in social situations. I also help with the research involved. The other is a program that does research with children and aims to learn more about their reading and learning skills and to figure out more effective ways of improving these skills for children. I am beyond excited about these opportunities and I am learning so much. This university also offers a broad range of marketing internships, and a few others. Another thing I realized while looking over my previous blogs is that you know nothing about the actual person writing this and telling you all of these amazing things that you really should do! To show you a little bit about who I am and to make reading this much more interesting, I posted a picture of myself above! 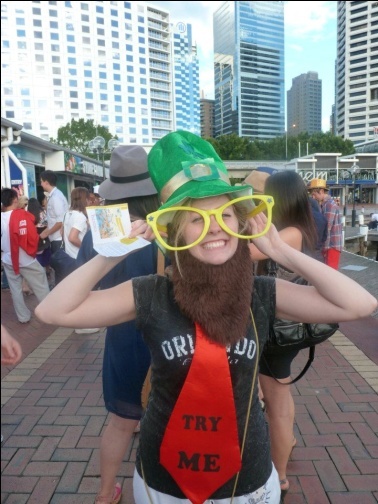 Yes, I am a short, 20 year old, female leprechaun. 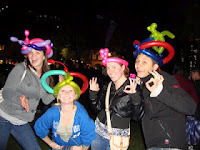 Well I was on that day, which was a twenty dollar open bar cruise for international students with the theme of “HATS HATS HATS!” So about me; I am student working on a psychology degree at the University of Madison Wisconsin, and studying abroad at Macquarie for one semester. This is the first time I have traveled anywhere but America and Canada, and I absolutely love traveling and experiencing new and different places. I have a wonderful family and boyfriend back home, as well as an adorable but cranky pet hedgehog. My favorite color is blue, I am horrible at cooking, and I like to do pencil drawings and shading. 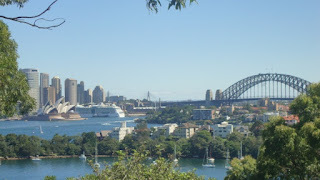 Now on to the fun, and some of my favorite things I have done so far; snorkeling, surfing, and a trip to the Taronga Zoo. 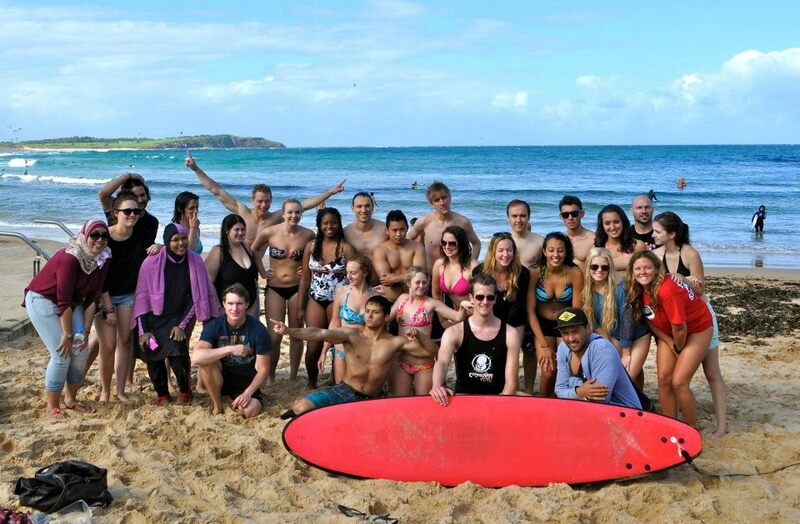 A few weekends ago I took a trip to Manly beach and was able to take some free surf lessons! It was a hilarious sight for everyone else watching me bail over and over off my surf board. Before I had done this I was pretty afraid of the ocean waves, but I had to try surfing and so I forced myself out into the water and jumped on my board and went for it. It was a ton of fun. 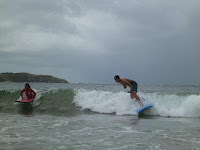 I rode on the knees for a few waves, did a few nose dives but got back up again, and was not able to stand up on the board until about fifteen tries later, but when I finally stood up I was hooked. I love surfing. 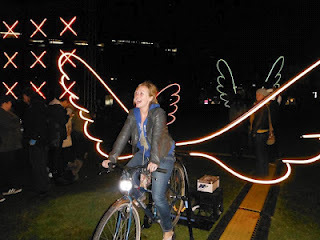 It is a blast and it is a must do at some time in every person’s life. I will need to practice some more and move on from the baby waves to the real waves. 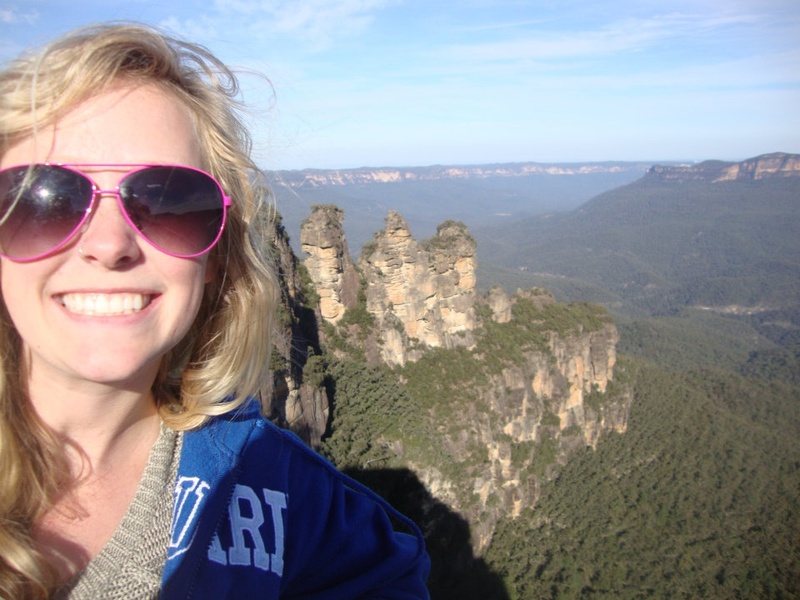 Let me tell you, I have been conquering fear after fear while in Australia, and it feels great. My fear of the ocean was further conquered when I went snorkeling around Shelly and Manly beach! These beaches are fun for snorkeling; however there are others that are far more beautiful (which I will be scuba diving at in a month or so). Snorkeling is great and cheap. I went with a friend, bought a mask and a snorkel, and we swam out on our own to see the underwater plant and animal life. We saw some bright neon looking fish, as well as an enormous fish that was almost my own size (I am 5 foot 1 and 110 pounds). It was huge! I also saw an eel hiding between some rocks which was exciting but also scary. 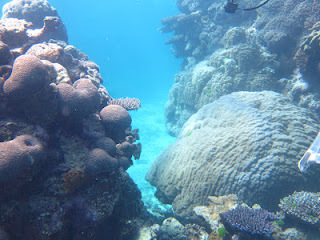 I had a blast snorkeling and I am so excited to go scuba diving at the Great Barrier Reef in May. 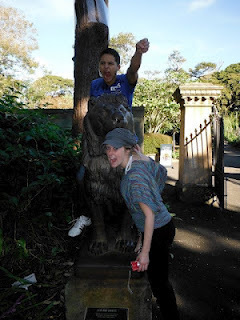 Another place that is a must see is the Taronga Zoo. It is about 44 Australian dollars for adults, but completely worth it. They have numerous exotic and fun animals that live are in great living conditions and are so different from any animals I have seen at the zoos in America. Of course I saw the kangaroos, finally my first one! 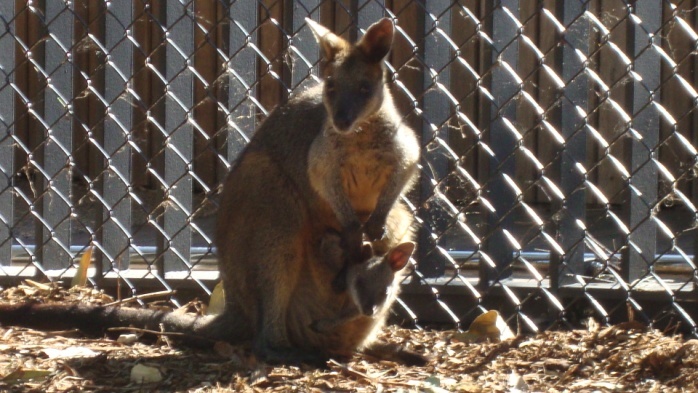 You are able to walk into the area where the wallabies are kept and pet them if they are willing, there is also a giant emu hanging around with them. 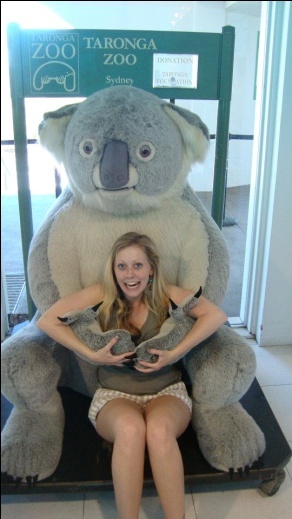 One of my favorites was the koala; they are so incredibly adorable I could not contain myself. 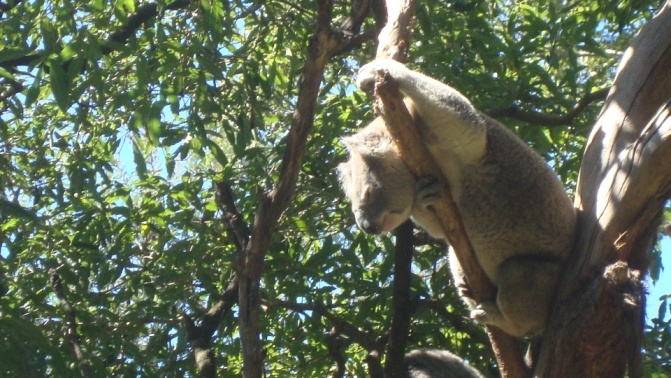 This zoo has so many animals, including some of the deadliest spiders, snakes and others, along with monkeys, giraffes, crocodiles, wombats, a giant komodo dragon, a snow leopard, lions, tigers, elephants, leopard seals, penguins and so many others. They also have giant spiders hanging in their webs above the paths; not something I enjoyed much at all considering they were not behind glass or anything at all! 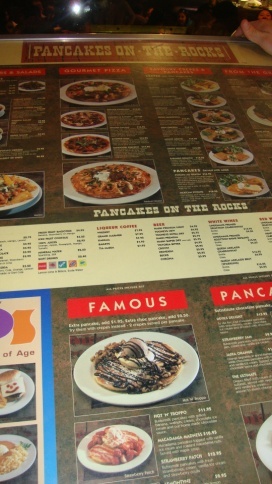 There are a few new Australian cuisines I have discovered while roaming the vibrant streets of Sydney; one is a MUST DO: Pancakes on the Rocks. The entire area is called the rocks and this specific restaurant has the absolute best pancakes I have ever tasted; and I am a huge pancake fan. These pancakes are served with delicious toppings and of course, ice cream. Every aussie I’ve met on my campus loves the place and it is tradition for us to go eat there every few weeks or so. Another interesting place I went to was a “secret bar”; you have to actually know about the place to find it, and it is behind a door that looks like a wall. The place is very nice and looks as if it were set in the 1930’s. Drinks are expensive with the cheapest being 16 dollars, but it is a fun atmosphere and I loved watching the bartenders make these extremely fancy drinks. 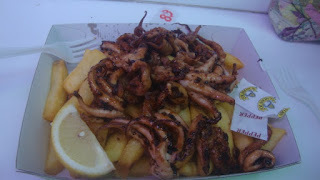 Now onto the not so great food tasting experience I had; marinated octopus. I do not regret trying it, I believe it is always good to try new and different things, but that was absolutely disgusting. The taste was fine, but I could not handle that texture. Just look at the picture above and you will understand. I do suggest that people try it though, because you may like it! 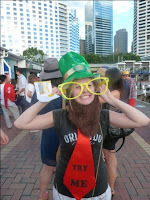 I am glad I did it; and next I will have to try some vegemite and kangaroo meat. These are all fun things that you can do right in Sydney, and there is so much more. I am eagerly awaiting my weeks of travel to other areas of Australia, including Byron Bay in Brisbane and the Great Barrier Reef in Cairns. 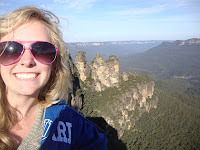 I have been here in Sydney for over a month, and I am starting to get very used to the aussie lifestyle. At times it can feel like I am at home and I start wanting more adventure and more fun and different experiences. However I do have a limited amount of money I cannot do all of the things I would love to do here or anywhere around Australia. One thing I would highly suggest to anyone traveling to Australia; bring a decent amount of money and overestimate the costs of everything! Cost of living is high and don’t think that you can get away with what you spend on things back in the states; it won’t work. Also, bring money for traveling and travel cheap and smart. Stay in hostels and be organized and careful with your spending. The less you spend doing one thing, the more you can travel and do other things. 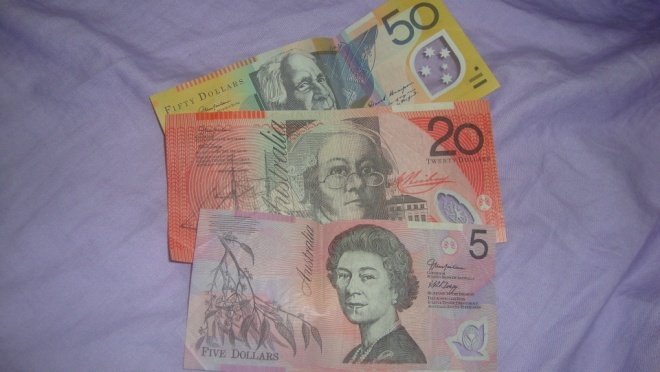 Coming to Australia from America you lose a large chunk of money converting it to the Australian dollar, and you spend more on almost everything you do and buy. Traveling around Australia is worth every penny. The area is absolutely beautiful and full of wildlife, fun activities, and friendly people. 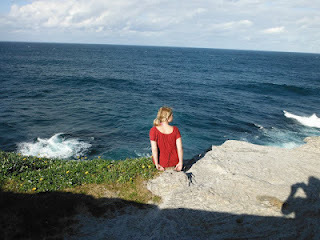 I am having a wonderful time and am looking forward to another three months down under. Maybe so, but when it comes to engagement, cash is the court jester. 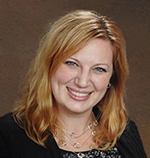 Research proves that non-cash incentives are far more effective. People will gush about a trip or item they earned, but cash lacks the same trophy value. They will forget how they spent the money, but they never forget an experience. Plus, once people get used to cash, they don’t see it as recognition– they usually feel its “owed to them” often negating the whole purpose behind a bonus or incentive award. Disengaged employees are far more expensive! CTS (Center for Talent Solutions) studies show that fully engaged employees are on average about 22% more productive than “normally engaged” employees. “Somewhat engaged” employees are about 75% as productive as normally engaged personnel. Furthermore, “disengaged employees” perform at only about 50% the value of normally engaged employees. * What are your disengaged people costing you now and what will they cost you later when the economy is back in full swing? Any professional worth their salt can help you design a program that has a positive ROI and should be able to demonstrate how an effective program is self-liquidating. We’d all like to think so, but how loyal you are to a store or brand? Everyone wants to be true to their local shop, but at some point most people go to the big box. You can’t count on loyalty unless people feel they are getting something in return. I am sure whatever business you are in you are an expert! If you are a plumber, I would come to you before I would try to fix my own pipes. So you have done a little research and you understand that this is an issue you should tackle, but if you are going to make a significant change and investment in your organization, why leave it to chance? I know a little bit about plumbing from remodeling my 100 year old house, but I am not willing to risk it. If I drywall over a pipe I put in myself, it might burst, and then whatever I “saved” just cost me a whole lot more! Not necessarily. A one-time event may give you a short term “boost”, but like an energy drink, it can fizzle out quickly. A good incentive program is actually a business formula by which you encourage desired behavior. Frequent flyer programs have been an excellent example of how airlines have maintained loyalty through the worst of times. Remember, incentives must be woven into your long term business strategies to be TRULY effective. To find out more, visit our website or call us at 1-855-551-FIRE(3473)!